The sports documentary and reality show Hard Knocks was created by HBO and the National Football League to illustrate a NFL team's ups and downs while preparing for the NFL season. The show looks at every aspect of training camp, both the personal and business aspects of the NFL. Actor Liev Schreiber narrates Hard Knocks and has held this position since the creation with the exception of season three, where die-hard Chiefs fan Paul Rudd narrated the Kansas City Chiefs' Hard knocks. Hard Knocks is exclusively shown on HBO and the NFL Network and has earned a total of seven Emmys, living up the high standards set by these networks. 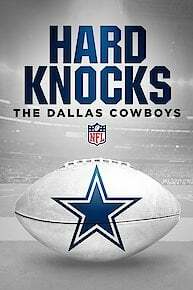 The Hard Knocks series began with the 2001 Baltimore Ravens, followed by the next season's Dallas Cowboys. There were then four years of hiatus until the 2007 Hard Knocks featuring Kansas City Chiefs came back with a vengeance, winning the program's first Emmy. The next year, they followed up with another Emmy win with the Dallas Cowboys, and later topped both years with the 2009 Cincinnati Bengals features, which captured 2 Emmys. The most eventful season belonged to the 2010 NY Jets, which focused on their outspoken Head Coach Rex Ryan, and a Super Bowl favorite team that earned Hard Knocks three more Emmys. The 2011 season featured owners locking out the players and causing the fourth work stoppage in the NFL history. Hard Knocks unsuccessfully tried to get a team to sign on due to the uncertain future. The 2012 Hard Knocks program will follow the Miami Dolphins, as announced by their Head Coach Joe Philbin in a May 2012 press conference. Hard Knocks gives the unflinching fans of the NFL a glimpse into what preparation, sacrifices, and even fun goes into being part of a NFL team. The challenges rookies face, team pranks, players' family life, and the end of careers, where wily veterans struggle to hold onto their positions are all gripping features that make this show such a success. Unfortunately, it is hard to get NFL teams to allow cameras to follow them, most citing strategic privacy. Other NFL teams think their young players may be distracted with the cameras and not prepare enough to be successful in the regular season. There is also the issue of the Hard Knocks curse, which may be a combination of the theory of distraction and an unknown force. All of the NFL teams that have participated in Hard Knocks have not lived up to the public's off season expectations for one reason or another. It will be up to the 2012 Miami Dolphins to come together and break the curse of Hard Knocks. The Browns travel to Detroit to face the Lions in the final preseason game, and final cuts are made before the start of the 2018 season. Some Browns players find their inner child, team cuts are on the horizon, and a key player returns. The grind and intensity of training camp produces flare-ups for both players and coaches on the practice field. The Browns play host Tyrod Taylor's former team, the Buffalo Bills, in their second preseason game. The Cleveland Browns journey to New Jersey to face the New York Giants in the pre-season opener. The players adjust to life with a new offensive coordinator and a fresh set of quarterbacks on the roster. Training camp begins as 90 players compete for 53 spots, but all eyes are on QB Baker Mayfield. General manager John Dorsey and head coach Hue Jackson welcome a new batch of veteran acquisitions, including QB Tyrod Taylor and receiver Jarvis Landry. Jameis Winston, Gerald McCoy, Mike Evans and DeSean Jackson prepare for the regular season. Rookie hopefuls Riley Bullough, aka "Joe Dirt," and Jeremy McNichols, aka "McWeapon," hope to survive the final cuts, when 37 players will lose their jobs. Former Heisman winner Jameis Winston, outspoken DeSean Jackson and Pro Bowl perennial Gerald McCoy, along with rookies and free agents, go through the first week of drills at Buccaneers training camp. Wow. Nobody enjoys being fired....well, some do, but only because losing a job you hate isn't always such a loss. But does anyone suppose Chad Johnson probably relished HBO cameras rolling as Miami Dolphins head coach cut him loose following a Saturday domestic violence arrest? It's all fallen apart quickly for Chad Johnson. The former NFL stand-out wide receiver was arrested Saturday for allegedly head-butting wife Evelyn Lozada during an argument. Consequently, the Miami Dolphins released him Sunday, VH1 shelved his planned reality show and now, Lozada has filed for divorce.